Bentonite has been studied extensively because of its strong adsorption capacity. A local Na-bentonite named GMZ bentonite, collected from Gaomiaozi County (Inner Mongolia, China), was selected as the first choice of buffer/backfill material for the high-level radioactive waste repository in China. 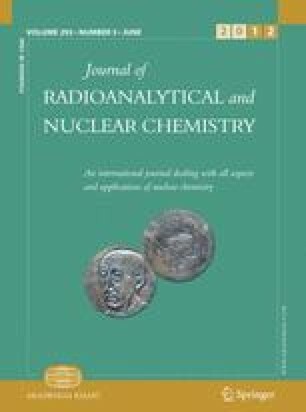 In this research, the adsorption of La (ΙΙΙ) onto GMZ bentonite was performed as a function of contact time, pH, solid content and metal ion concentrations by using the batch experiments. The results indicate that the adsorption of La (III) on GMZ bentonite achieves equilibration quickly and the kinetic adsorption follows the pseudo-second-order model; the adsorption of La (III) on the adsorbent is strongly dependent on pH and solid content, the adsorption process follows Langmuir isotherm. The equilibrium batch experiment data demonstrate that GMZ bentonite is effective adsorbent for the removal of La (III) from aqueous solution with the maximum adsorption capacity of 26.8 mg g−1 under the given experimental conditions. The present work has been carried out under the financial supports of “National Natural Science Foundation of China (40802064, 20706045 and 41030748)”, “Innovation Program of Shanghai Municipal Education Commission (12ZZ032)”, “Scientific Research Fund of Hunan Provincial Education Department (11A010)” and Kwang-Hua Fund for College of Civil Engineering, Tongji University.